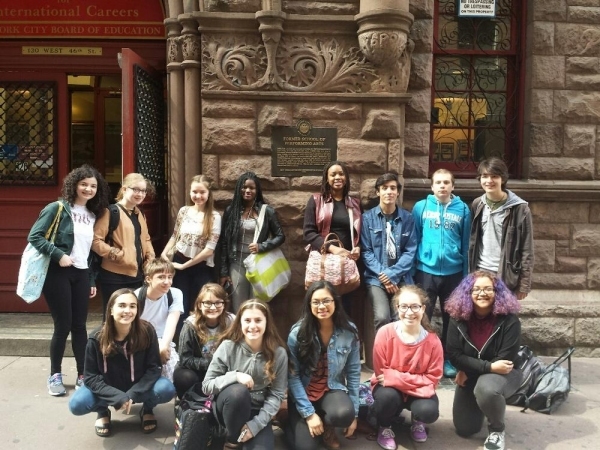 The cast of FAME: The Musical from Amas Musical Theatre's Rosetta LeNoire Musical Theatre Academy took a break from rehearsal on Sunday to visit the original FAME School on West 46th Street. Scroll down for a photo! From 1948 to 1984 it was The School of Performing Arts. Founded by Principal Franklin J. Keller, his faculty and an advisory commission of leading professionals in dance, drama and music, it offered professional training combined with academic education. Before there was GLEE, there was FAME! FAME: The Musical, based on the 1980 musical film conceived and developed by David De Silva, with a book by Jose Fernandez, lyrics by Jacques Levy, and music by Steve Margoshes (Title song "Fame" by Dean Pitchford & Michael Gore), will be directed by Christopher Scott and David Drake (Associate Director), with choreography by Monica Johnson and musical direction by Trevor Bachman. FAME: The Musical follows the final class of students from admission to graduation at New York City's celebrated High School for the Performing Arts. With a contemporary rock score, FAME shows the struggles, fears, and triumphs of these young artists as they navigate the worlds of music, drama, and dance to achieve their dreams. Long before "Glee" there was FAME! The cast of 29 includes Teen Academy members: Cassie Barckett, Daniella Berman, Paul Byrd, Julien Feret, Soli Garzon, Celia Gooding, Wayne Hampton, Fofie Johnson, Nicole Klokiw, Audrey Lang, Emily Lang, Benjamin Miller, Sheika Murray, Andrew Odnoralov, Katherine Oquendo, Louise Palmer, Crystal Phitts, Alani Gabrielle Ramirez, Jahata Richards, Michelle Richards, Isabella Rivera, Quincy Rodriquez, Aysha Saldana, Infinity Stewart, Jameel Timberlake, Amy Tolentino, Emily Viega, Molly Viega and Benjamin White. The creative team includes: Josh Iacovelli (Set Design/Production Supervisor), Joyce Liao (Lighting Design), Dustin Cross (Costume Design) and Marta Ronconda (Stage Manager). Performances will begin on Friday, May 1, 2015 (and continue through May 10) at The Theatre at the 14th Street Y (344 East 14th Street - between 1st & 2nd Aves). Tickets are $20 (adults) and $17 (students & seniors) and can be purchased by calling Ovation Tix at (212) 352-3101 or by clicking here. For more information, call (212) 563-2565 or visit amasmusical.org.